Most economists agree that as the number of boomers leaving the workforce swells, younger workers will shoulder ever-greater burdens. Social Security will be bankrupted by all these lazy old people! Medicare exhausted! These dire predictions of economic turmoil are biased, outdated, and just plain wrong, and it was great to see a recent article in the New York Times, “Disproving Beliefs About the Economy and Aging,” take aim at them. Much of the hand-wringing centers on the loaded term “old age dependency ratio,” which compares the number of people ages 15 to 64 (workers) with people 65 and older (dependents). In recent years, many scholars have criticized this dependency ratio because of its crudeness as a measure and because of its blatant anti-olders ideology. The “old age” modifier starkly separates older Americans from the general population, labeling them economic dead weight the day they hit 65. (The age at the other end of the scale reflects its agrarian origins, when young people on farms began their work lives.) “Its premise—that the growth in the ratio indicates how greatly baby boomers will burden the rest of society—is shaping some of the most consequential debates in the United States today,” writes Yale Law School professor Lincoln Caplan in the American Scholar, in a superb article that lays out the public policy implications. The reality is far more nuanced, to say the least. Americans draw heavily on their own resources in retirement, and many never become wholly dependent on government support. Many people require benefits well before they turn 65, and a growing proportion remain employed long after it, both by choice and by necessity. The world is changing. The concept of fixed retirement at a certain age is nearing obsolescence. Far fewer jobs are physically taxing. Healthier and better educated than earlier generations, boomers are staying in the job market longer and expanding the definition of “working age” in the process, a welcome development. That was true before the economy tanked, at which point four out of five boomers had already declared their intention to keep working and earning in retirement—if it can still be called retirement. 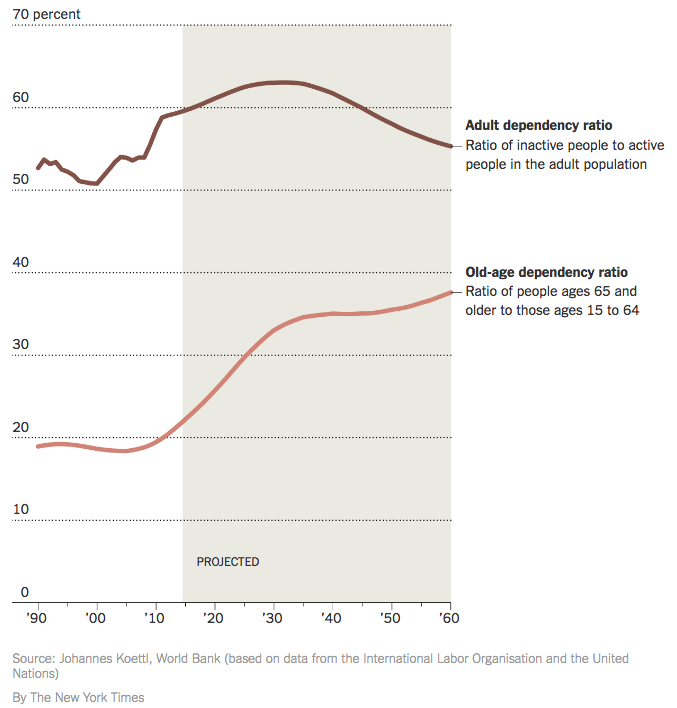 So it’s great news that the World Bank has developed a long-overdue alternative formula, called the adult dependency ratio, which takes these trends into account. Instead of comparing the ratio of older to younger workers, it compares the ratio of inactive adults to adults who remain economically productive. This ratio stays more or less constant until it eventually declines, and depicts a far more reassuring economic forecast. This more accurate prediction is enormously important, because it counters the reactionary narrative that a putative “gray tsunami” is to blame for what ails the US economy. That alarmism is used to justify further efforts to shrink the welfare state and public assistance programs, even though exactly the opposite is called for if the country is to meet the needs of its older citizens in the years to come. An aging population does indeed post significant challenges, but it’s no tsunami, it’s not the main cause of the problems facing our economy, and it shouldn’t be framed that way. Alarmist forecasts also fail to account for the significant, fast-growing, and often-overlooked “longevity economy,” which in 2012, according to the AARP Journal, accounted for 46 percent of US gross domestic product ($7.1 trillion). Americans over 50 control approximately 70% of the country’s disposable income. This spending fuels the apparel, health care, education and entertainment industries, among others. These statistics capture only part of the economic contribution of older Americans, whose unpaid volunteer work in 2013 was valued at $67 billion. And while “entrepreneur” might conjure up an image of a kid in that proverbial garage, twice as many successful American entrepreneurs are over age 50 as in their early 20s.. More resources have always flowed from older generations to younger ones than the reverse. In the 20th century, the American lifespan increased by an astonishing 30 years. Roles, policies, and institutions have yet to catch up. “Social change takes time, even when it is visibly underway,” as Caplan observes. “But,” he continues, “change accelerates when outdated ways of thinking are put aside in favor of useful new ones.” The experience, skills, and drive of millions of healthy, well-educated, older Americans—their cumulative social capital—represent a vast and unprecedented resource. We can’t let ageism, inertia, and anti-communitarianism prevent us in from tapping into it in millions of interesting ways. I like “silver reservoir a lot, and have taken to using it myself. Thanks Jeanette Leardi for putting me on the right path. Here’s a March/April 2017 report from the International Standards organization, “How 21st-Century Longevity Can Create Markets and Drive Economic Growth” — https://www.iso.org/isofocus_121.html. It’s ageist and classist (all about “active aging”), but contains useful information about the longevity economy. The framing is ageist but the point is well taken: 65-year olds aren’t young, which makes them valuable employees.